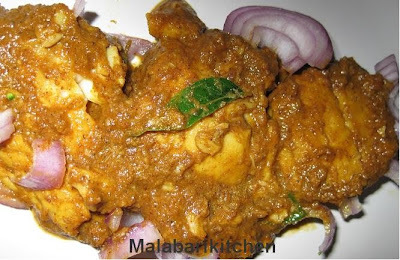 This is a spicy fish curry made with fried coconut. People who like sour taste will surely like this recipe. This can be made with any big fish. This dish is more popular in southern Kerala. =►Clean and cut fish into medium size pieces. =►Soak tamarind in water and make tamarind juice and keep it aside. =►Heat 1tsp of oil in a pan, add coconut and sliced shallots into it. 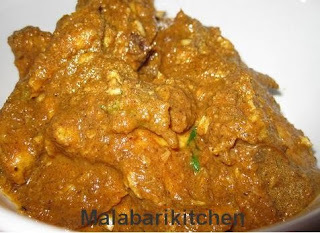 =►Fry it till the coconut turns light brown and grind it well (no need for more water). =►Heat the same pan(sim flame) put chiilly and coriander powder and saute it(1-2min). =►Boil tamarind juice in a pan along with turmeric, green chilies and salt. =►When the fish pieces cooks well pour grinded coconut paste into it. cook it for 2-4min and switch off the flame. =►Finely pour 1 tsp of coconut oil and curry leaves into it. kollalo.. nalla space.. Following you Lisha..